Tim - This is an additive process. The alternative ones are subtractive and formative. So, we have a block of wood and you take stuff off it. Formative is when you have a piece of material and you squish it into the right shape. But 3D printing or additive manufacturing literally is additive. You start off with nothing and you build something up layer by layer. Perhaps a way of thinking about this is to remember back to primary school. When you first did pottery, you were maybe given a blob of clay and told you to make something. The way you did it was, you got little bits of the clay and you rolled it out into a little worm shape and you joined the ends up and you put a circle down and then you did the same again. You built up a little cup or a little vase which you proudly took home. So, that's an additive layer process and that's what 3D printing basically is. It's got 2 broad types. One when you're working in a liquid form. And one where you're working in a powder form. So, the liquid one is you're either squirting something out of a tube like a hot glue gun and you build up the shape layer by layer that way or you start off with a vase of liquid and you use an ultraviolet laser to selectively make it go solid in the places you want layer by layer. The alternative way is using powders. So, metal powders, ceramic powders, plastic powders. The way to think of that one is, imagine if I poured dry sand onto the table and then squirted some glue into a circle shape and then blew the dry sand away. You'd be left with a layer of a solid object. You put more sand down, more glue on top of that and blew the sand away again, you'd slowly build up the object. 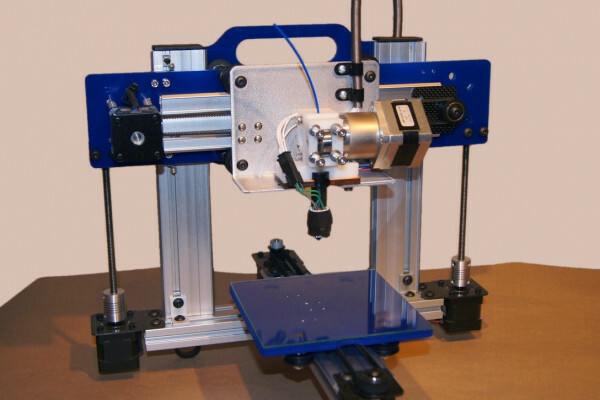 Kat - People may be most familiar with some of the 3D printers that are coming into our homes that use various types of plastics and things like that. We've had a Tweet from our listener Simon Archer who says, "What kinds of materials can we do 3D printing with?" Tim - So, the main materials are plastics, but also, ceramics and metals can be used. A particularly interesting area is when you have multiple materials. Kat - We've had a tweet from our listener Ed Wilson and he says, "Are multi-material structures possible?" How can you do more than one type of material in a printer? Tim - It's very clever - this. So, the idea is that you have conductive metal track inside a piece of material being produced. In plastics, you'd have to have multiple nozzles at work there and some very clever, very challenging technological barriers that need to be overcome there. But the dream is, you could then print things such as a component for an aircraft with strain sensors built into it. You could have electrical conductors built into objects that are made out of plastic, but we're a little way off that at the moment. Kat - Some of the things you hear about, they seem like they're replicated from Star Trek where you just put it in and like, bingo! Here's Sunday lunch. But in a more realistic, perhaps now, we're in the very near future, what are some of the main applications of 3D printing technology? Where are they going? Tim - Well, maybe just to give a tiny bit of background, it's gone through broadly 3 phases. We started off making models and prototypes and that's still a big part of 3D printing. You make a replica of the thing you want. If you're making a new phone or a new drill or something, you make it as a model to see what it would look like before making it in the normal way. Then we moved on to making moulds. So at the moment, if you want to make your Lego bricks or mobile phone plastic case, you'd make a mould and then make lots and lots of identical model versions of it using plastic. The cost of those moulds is very, very high in the process of making them quite slow. With 3D printing, you can actually print these moulds much cheaper and much faster. But the exciting bit and I think this is where people have got really interested is the fact you can produce now the finished, final part of the thing you want. In particular, interesting areas there are in medicine, aerospace, and automotive. Kat - And so for example, just to give me a really quick example, we saw a recent story where a child had had a vertebra printed. Is that a really growing area of these replacement prosthesis? Tim - Medicine really does seem to be taking off and there are three broad areas. One is, replacing missing limbs and some very exciting area is the low cost area. If anybody has a moment to go and look at websites where they talk about project Daniel or Robohand on YouTube, really interesting projects there. We also see hearing aids being printed in this way that go in your ear. There's then implants so surgeons actually producing replacement - for example for a severe injury to the face. They can produce part of your face, exactly as it was before. The third area of medicine, is around producing a living part of the body. So, it's either stuff you attach to the body, stuff you insert in the body, or stuff that's in the body to grow. Previous Could you 3D print a spare kidney? Could you 3D print a spare kidney?